We had a busy week - check out the videos of the October 17 Town hall (1st and 2nd parts) and the No Muslim Ban protest on October 18. 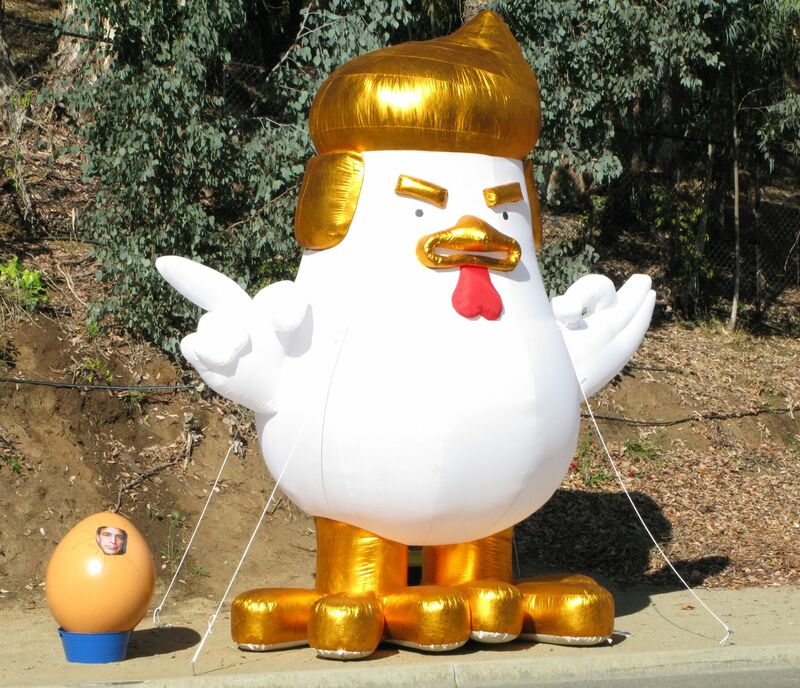 The Trump Chicken made an appearance at our weekly rally (and laid a special egg!). See the photos. Reminder: Get your letters on social justice issues to our local High School Senior, Maddie, for delivery to Issa in D.C. in November. The deadline is October 28. Click here for more information. Our November 5 membership meeting is coming up fast. Please register now, and if you're able to help, the sign-up sheet is posted. Tuesday, October 24, 10:00 a.m.: Weekly Rally at Issa's Vista Office - Tell Issa to Stop the War on Women! From controlling women's health care to making a sexual predator their President, the Republican party is waging a War on Women. From voting to defund Planned Parenthood to his continued support of a sexual predator President, Darrell Issa is complicit in the War on Women. So women - and the men who love them - let's show up in numbers Tuesday to remind Issa that he works for us and we want him to STOP being complicit in the War on Women! RSVP and details here. On Monday, the House is voting on HR 4010, the Congressional Subpoena Compliance and Enforcement Act of 2017—sponsored by Issa. This bill would strengthen Congress’s power to serve subpoenas and have them honored—levying fines against the heads of government agencies in the executive branch who do not do as subpoenas request. On Tuesday, the House is voting on HR 3898, a bill that places financial sanctions on North Korea. On Wednesday and Thursday, the House is voting on HR 1698—to expand sanctions against Iran with respect to Iran’s ballistic missile program. According to the pro-Israel lobby, this bill was written to strengthen the Iran Deal, not conflict with it—targeting anything having to do with ballistic missile building. According to NIAC Action, a group “advancing peace and the Iranian-American community,” this bill risks undermining the Iran Nuclear Deal. The House will also vote on laws designating Hezbollah as a terrorist organization. Support Maddie's project by sending her letters about the social justice issues you want Issa to address. Last date for letters is October 28. Click here for more information. File a complaint with the Sheriff Dept's Internal Affairs by calling (858) 974-2065. Please take action! Don't assume someone else will do it for you.